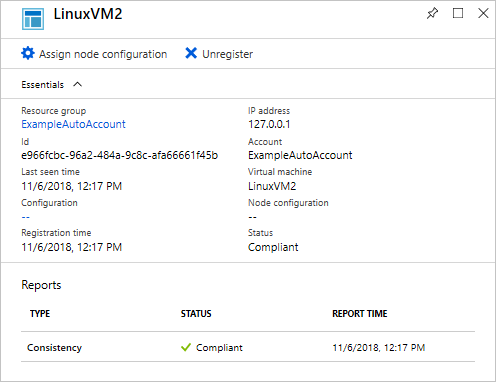 By enabling Desired State Configuration (DSC), you can manage and monitor the configurations of your Windows and Linux servers. Configurations that drift from the desired configuration can be identified or auto-corrected. This quickstart steps through onboarding a Linux VM and deploying a LAMP stack with DSC. An Azure subscription. If you don't have an Azure subscription, create a free account. An Azure Automation account. For instructions on creating an Azure Automation Run As account, see Azure Run As Account. There are many different methods to onboard a machine and enable Desired State Configuration. This quickstart covers onboarding through an Automation account. You can learn more about different methods to onboard your machines to Desired State Configuration by reading the onboarding article. In the left pane of the Azure portal, select Automation accounts. If it is not visible in the left pane, click All services and search for it in the resulting view. In the list, select an Automation account. In the left pane of the Automation account, select State configuration (DSC). Click Add to open the VM select page. Find the virtual machine you would like to enable DSC for. You can use the search field and filter options to find a specific virtual machine. Select the DSC settings appropriate for the virtual machine. If you have already prepared a configuration, you can specify it as Node Configuration Name. You can set the configuration mode to control the configuration behavior for the machine. While the Desired State Configuration extension is deployed to the virtual machine, it shows Connecting. Modules contain DSC Resources and many can be found on the PowerShell Gallery. Any resources that are used in your configurations must be imported to the Automation Account before compiling. For this tutorial, the module named nx is required. In the left pane of the Automation account, select Modules Gallery (under Shared Resources). This quickstart uses a DSC configuration that configures Apache HTTP Server, MySQL, and PHP on the machine. For information about DSC configurations, see DSC configurations. In a text editor, type the following and save it locally as LAMPServer.ps1. In the left pane of the Automation account, select State configuration (DSC) and then click the Configurations tab. Select the configuration you imported in a prior step, "LAMPServer"
In the Configuration view, you see a new Compilation job queued. When the job has completed successfully, you are ready to move on to the next step. If there are any failures, you can click on the Compilation job for details. A compiled Node Configuration can be assigned to DSC Nodes. Assignment applies the configuration to the machine and monitors (or auto-corrects) for any drift from that configuration. In the left pane of the Automation account, select **State Configuration (DSC) and then click the Nodes tab. The status of all managed nodes can be found in the State Configuration (DSC) and then under the Nodes tab in the Automation Account. You can filter the display by status, node configuration, or name search. To learn more about PowerShell Desired State Configuration, see PowerShell Desired State Configuration Overview.